DAMN! This would be another GURR-REAT 'Juan to be At! And thus, as I searched my mental data banks for Maserati memories, I'm a bit embarrassed to acknowledge that two of my initial Flashbacks were for another Italian marque which probably doesn't get a lot 'O respect either, as the two vehicles I'd remembered were Alfa Romeo's instead; YIKES! Hence, it seems a bit farcical to think I could adequately portray Maserati's storied Centenary history in a single blog-post, as the Italian auto manufacturer under the ultimate control of Fiat the past two-decades plus, is rightly this year's honoured marque at the Rolex Monterey Motorsports Reunion in beautiful Monterey, CA. As history denotes, the Maserati Automobili concern was incorporated on December 1st, 1914 in Bologna, reportedly having been formed by Maserati brothers Alfieri, Ettore and Ernesto, albeit there were seven brothers in total; Aye Karumba! With Carlo, the eldest dying in 1909, while Mario was the artist behind the Marque's revered Trident emblem, as Bindo seems relatively unknown, whilst Alfieri I died at the age of one. Apparently Maserati's initial foray into auto racing commenced 'Wayback in 1926 when Alfieri was at the controls of one of their earliest models en route to winning that year's Targa Florio! Yet sadly, Alfieri died in 1932 whilst the other brother's continued on with the company's business of motoring. And whilst I'm not overly familiar with the 4CL or 4CLT's history, nevertheless I know about them vaguely due to their association with Grand Prix racing beginning in the late 1930's and continuing thru the early 1950's when today's modern Formula 1 championship began, as the name Reg Parnell comes quickly to mind after having done a few stories on the inaugural F1 championship race, the British Grand Prix, circa 1950. And I also recall scribblin' briefly about the Maserati's success here Stateside in arguably our most historic race, thy Indianapolis 500 where Wilbur Shaw won twice in-a-row (1939-40) aboard the Boyle Maserati 8CTF, a year prior to the outbreak of World War II. As Shaw came tantalizingly close to an unheard of Hat-trick, while Shaw and Maserati became the first to win the race Back-to-back. 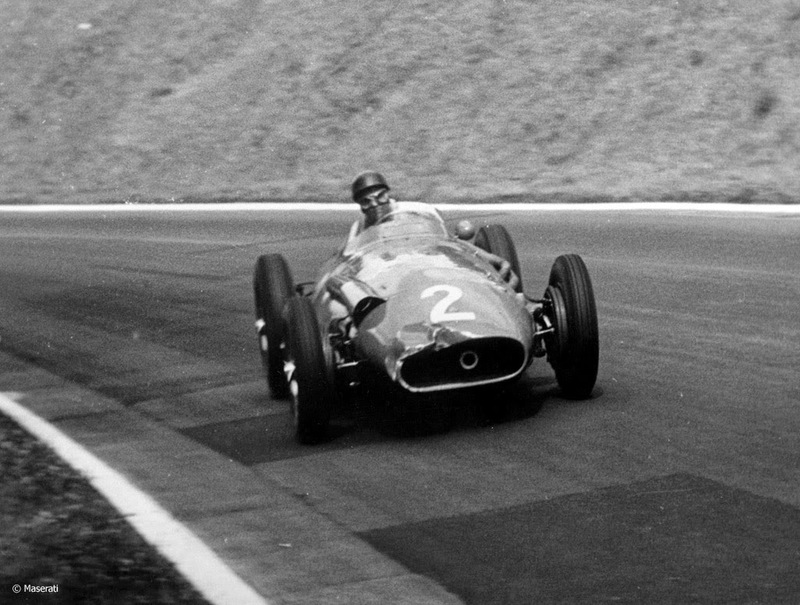 Maserati's zenith in motor racing was unquestionably El Maestro, nee the legendous' Juan Manuel Fangio's clinching of the 1957 Formula 1 world championship in the stunningly beautiful 250F racecar, which for Mwah, is the most alluring front engine F1 racer of all-time! Meanwhile, on the production side, I'm really not very well acquainted with Maserati's linage, albeit have always had a quirky admiration for the much heckled Biturbo, whilst I still remember foolishly trying to play chase with a co-worker's mid-engine Bora. Unfortunately, the Maserati brothers were forced to sell their company to the Italian Industrialist Adolfo Orsi in 1937, having fall en into financial difficulties, albeit remaining involved in the engineering side during a further ten years contract before being able to break-away from underneath Orsi's grasp. Next they formed OSCA, which I'd always thought was derived from their first names initials, (all these years) but having finally looked I-T up, now know that it stood for Officine Specializzate Costruzioni Automobili - Fratelli Maserati SpA instead; OOPS! Although OSCA, as it was known for short was indeed formed by the Maserati brothers Ernesto, Ettore and Bindo - and survived for two decades before being disbanded, , as I was also unawares that Sir Stirling Moss and co-driver Bill Lyon had won the Sebring 12 Hours aboard an OSCA in 1954. From there, control transferred into Alejandro De Tomaso's hands, later coming into partnership with the then Lee Iacocca led Chrysler concern, which resulted in the much distained Chrysler TC by Maserati, before Italian arch nemesis Ferrari took control of the car company in the early 1990's, which today is now part of the Maserati-Alfa Romeo-Abarth concern, under the Fiat-Chrysler umbrella. Hence, it's nice to notice that the Maserati marque is being given its due around the world, having found the following story upon Zed Internetz about how a Belgian museum is paying homage with the following Centennial celebration. While I also recall hearing about IndyCar Piloto 'TK "Follow-your Schnoz" Kanaan having taken delivery of one of the concern's latest ultra BAD ARSE Supercars, the MC12 several years ago, having now rediscovered that it was on a 2008 episode of Supercars Exposed hosted by Formula 'Duh (D) DriftMeister Tanner Faust. As these supercars, derived from the Ferrari Enzo (road car) were fairly successful in recent Sports Car racing, specifically the FIA's GT1 category, as I found this video of one said vehicle being put thru its paces at the legendary Spa-Francorchamps circuit.